Our friends at the Oregon Employment Department recently released the latest overview of firm size in 2014 on their blog. This edition of the Graph of the Week takes advantage of their work. I think there are some misconceptions about firm size, job growth and the like. I hope to address a few more of these issues in the coming months, particularly around start-ups. 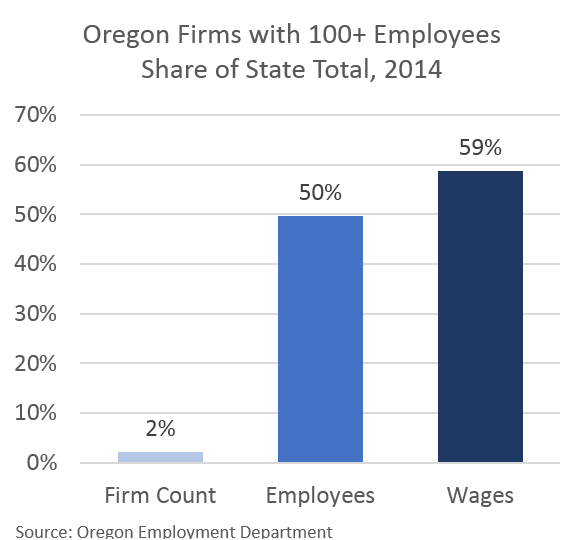 In the mean time, the latest firm data shows that businesses with 100 or more employees account for just 2 percent of firms statewide, however they employ half of working Oregonians and pay nearly 60 percent of the wages. It’s important to keep in mind that large and relatively large businesses play an integral role in the economy. Yes, start-ups are important and entrepreneurship is vital for innovation. However their biggest impact is when one (or hopefully more) of these start-ups is successful and grows quickly, adding employees as sales take off. Thus they become a (relatively) large business. Part of this creative destruction process, as highlighted previously, is that young firms have both a high job creation rate and a high job destruction rate, as many new firms do fail. The successful ones — those able to grow into a large business — end up employing a majority, or a plurality, of Oregonians. For a more in-depth look at firm size in Oregon, see this informative OED article by Phoebe Colman. Unfortunately I do not know of a complete and publicly available list of that information. There are vendors out there that have some of the information (InfoUSA being one I know of offhand.) Similarly the Employment Department does post some similar information, again based on these third party vendors data, not based on state records. See this link.